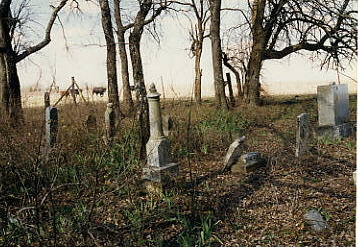 This cemetery is on private property. There is a sign on the gate that says, "Trespassers will be shot." The land belongs to the Gunnells who live in Dallas. There is no house on the farm. The gate is kept locked. The land owner does not maintain the cemetery. He also does not like to let people visit it. FM 2194 is also known at the Merit Road. John Pendleton came from Rye Cove, Virginia, and settled on the hill northeast of the cemetery in the late 1850's. He was a Baptist and preached in Farmersville and at the nearby Midway Baptist Church. In a letter he wrote in 1859 he said that land in the area was selling for $2.00 an acre. Large tracts were still available. He and his son, John, are buried in the cemetery. His grandson, John, still lives on the other side of the hill. 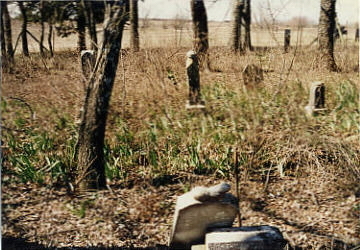 The cemetery is about 15' by 45' surrounded by a 4-foot barbed-wire fence. It is full, containing about 25 graves. At the time of my visit, the grass was tall and there were some fallen branches. All of the stones are upright and are in good condition. Some care is given to the cemetery by family members.